It’s less than two weeks until baby’s due date, and last night I awoke with what was perhaps my only, or at least my most intense and bizarre food craving. Admittedly, I have been a hound for sour cream, yogurt – okay, dairy products of all kinds. That, and Barbara’s Multigrain Spoonfuls cereal. So it’s not like I’ve been totally without… needs. But all along I’ve figured that these “cravings” have been little morse-coded messages from my body, alerting me to actual need for calcium, fat, fiber, etc. And I’m pretty confident the baby-factory didn’t require the nutrients found within a giant bowl of graham cracker crumbs mixed with melted butter. Because that is what I desired at 3 o’clock in the morning. A delicious, buttery slurry of busted-up graham crackers. Which, of course, we didn’t have; in fact, I can’t even think of the last time I bought a box of graham crackers. And while we’ve all heard the schtick of a wife sending her husband out to the grocery store for a midnight container of Ben & Jerry’s and a jar of pickles, I tossed and turned, trying to turn my mind away from my sinful craving. I didn’t figure Justin would go for such a demand, and anyway, we live in Maine, not New York City. The local Hannaford isn’t exactly 24-7. Although the intensity of my obsession had cooled by morning, I was still keen on picking up a box of grahams. I started thinking about a more civilized option for my salad bowl of buttered crumbs. Perhaps a nice graham cracker crust pie. Filled with a dairy-rich custard. At first I thought about a fruit-topped pie, but then my mind wandered to coconut. I had a bag in our pantry, and upon a quick internet search I found an easy recipe for coconut cream pie, compliments of Emeril Lagasse. Bam. The big man’s recipe called for a regular old pie crust, which I edited out in place of my desired graham cracker crust. The whole shebang took about 45 minutes, and I must say I was pleased with the results. 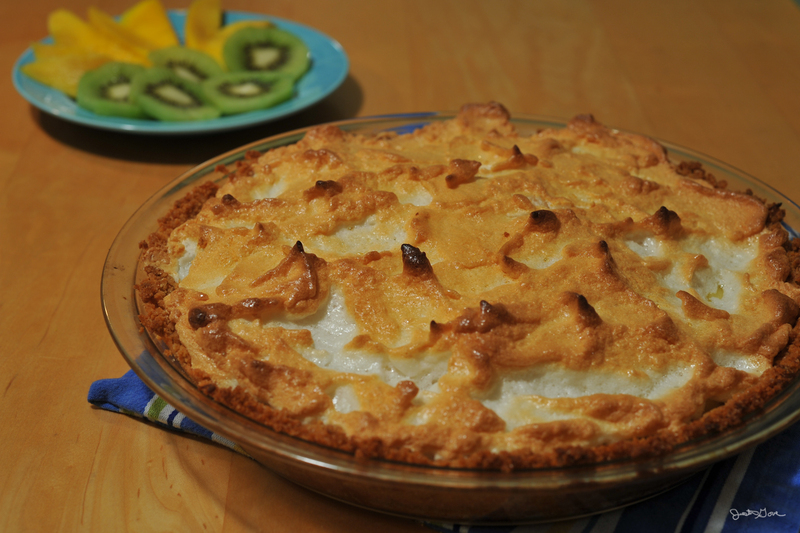 Topped with fluffy meringue and served with a few slices of fresh mango and kiwi, it was a perfect treat for a snowy, Saturday evening. To prepare the graham cracker crust, crush or use a food processor/blender to make 1 1/2 cups of crumbs (about 10 full sized graham crackers). Toss the crumbs with 1/2 cup sugar, a little bit of cinnamon, and a handful of toasted coconut. Melt 1 stick of butter and thoroughly stir into the crumb mixture. Pack the buttery crumbs into a standard pie plate, permitting yourself to eat at least one spoonful, and bake the crust for 8-10 minutes in an oven at 350 degrees. Because I did not make any alterations to Mr. Lagasse’s coconut cream recipe, I’ll link to it here. What's cooking? Get fresh food ideas delivered piping hot by email or to Facebook. Follow or Like Megansmark below.